kc bob: The Blizzard of Oz! Yes, it is snowing in Kansas City. I agree with Carl Reiner. I had hoped the precipitation would wait until March but it seems that our drought plagued area is getting much needed moisture today. It has been coming down at a 2-4 inches an hour clip this morning and some are thinking we might get 20 inches of the white stuff before the it ends. 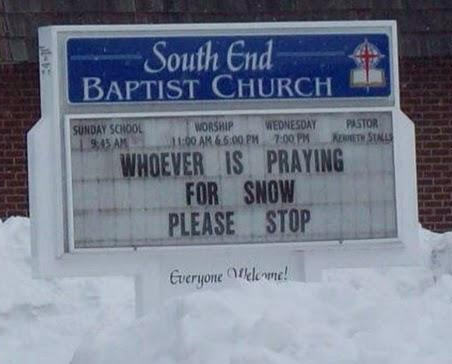 I offered a prayer this morning for those who need to be out in the weather. Please join me interceding for the safety of folks in my city and others who are traveling through. Love that photo. Keeping prayers for safety in my thoughts today. My husband is in Oklahoma this week and he had snow yesterday! Agreeing in prayer for the safety of all in this storm. We had some sleet last night. Thanks for the prayers. Looks like we are clear until Monday!